Female Common throughout Britain and Ireland although only scattered records from east anglia and apparently absent form n.e. Scotland. A flightless species occuring under logs in damp woodland and, in the north and west, among long vegetation on open moorland. Less commonly found in damp and shaded situations in parkland and gardens. Common throughout the Watford area in and around damp woodland. 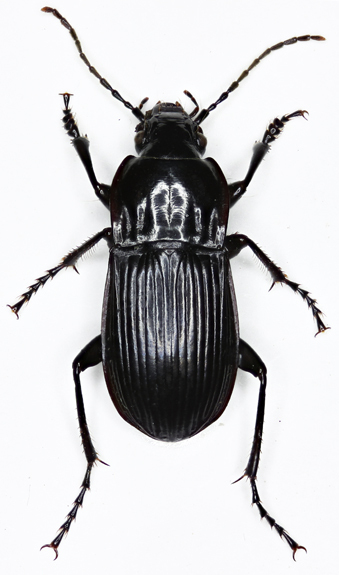 We have recorded them beneath logs in Whippendell wood during all months of the year and often in company with other carabids e.g. P.niger,	P.nigrita and Cychrus etc, also commonly with Ocypus olens (Muller). They are active nocturnally among leaf litter and spend the day under logs in shaded situations. Although common throughout the year, typically several occuring under many of the logs examined, they seem to be most abundant during the autumn. 18-22mm. This species is recognised in the field by its broad and flat form, sexes are obvious by the dull female elytra. 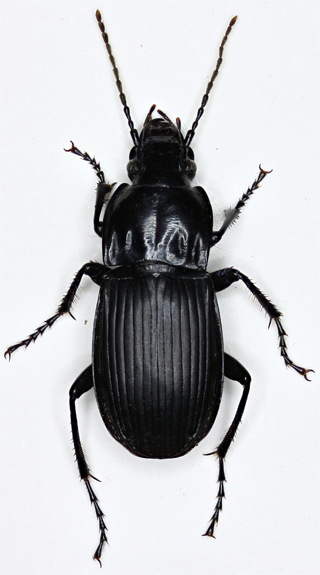 The only common carabids likely to be confused with Abax are Pterostichus niger Schaller and P.melanarius Ill., neither are as broad or generally as large and a quick examination (X10) of the humeral area will settle the matter. Antennae pubescent from fourth segment. Mandibles broad and protruding. Head expanding laterally in front of eyes beneath antennal insertions, with two setae and a series of furrows inside eyes. Pronotum impunctate, slightly transverse with well developed margins to front angles and two elongate basal fovea. Elytra with well impressed striae and gently convex interstices, seventh interstice raised into a ridge at base, unique to Abax, and a ninth striae well developed close to mrgin in posterior half. Shoulder with a distinctive 'hooked' tooth. Legs long and stout, all tibiae with well developed terminal spur on inside. 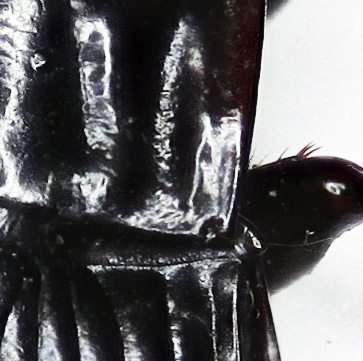 Tarsal segments smooth and glabrous above, terminal segment of metatarsus setose beneath ¹. Male with dilated basal protarsal segments.